AWS Auto Scaling provides the great benefit of being able to adjust the number of application instances to the level of demand. One of the most beneficial features of the cloud is the ability to automatically scale the number of computing instances. With AWS Auto Scaling, you can change the number of EC2 instances in an Auto Scaling group, either manually or automatically, based on schedule or demand. Auto Scaling helps reduce cost by adjusting the number of instances to the right number for the current workload. Additionally, Auto Scaling restarts failed instances, which adds resilience to your applications. Load balancing is crucial when using Auto Scaling. 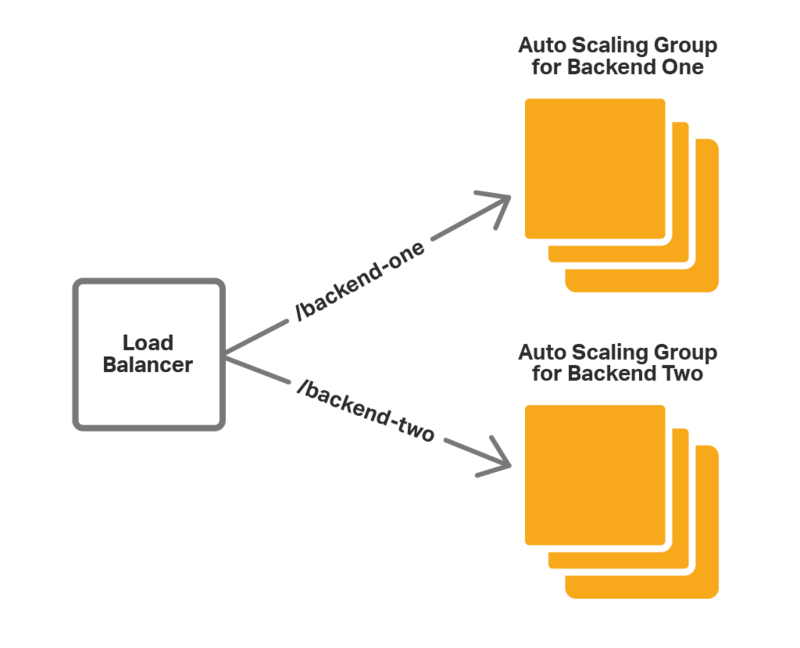 AWS provides load balancing of instances of Auto Scaling groups by integrating its built-in load balancers — Elastic Load Balancer (ELB), now officially called Classic Load Balancer, and Application Load Balancer (ALB) — with Auto Scaling. NGINX Plus provides advanced cloud load balancing for any cloud environment, including AWS, and supports AWS Auto Scaling groups. NGINX Plus provides multiple advanced features that ELB and ALB lack. The pricing model for the AWS load balancers (especially ALB) is complex, making it hard to predict costs. NGINX Plus pricing is straightforward, whether you purchase the NGINX Plus subscription directly from us or run prebuilt NGINX Plus instances from the AWS Marketplace, which are billed at a set hourly rate. NGINX Plus doesn’t tie you to platform-specific APIs, allowing you to reuse the load balancing configuration across multiple cloud platforms. To see how NGINX Plus compares to (and works together with) the AWS built-in solutions, read our blog posts on ELB and ALB. Using NGINX Plus in front of ELB. 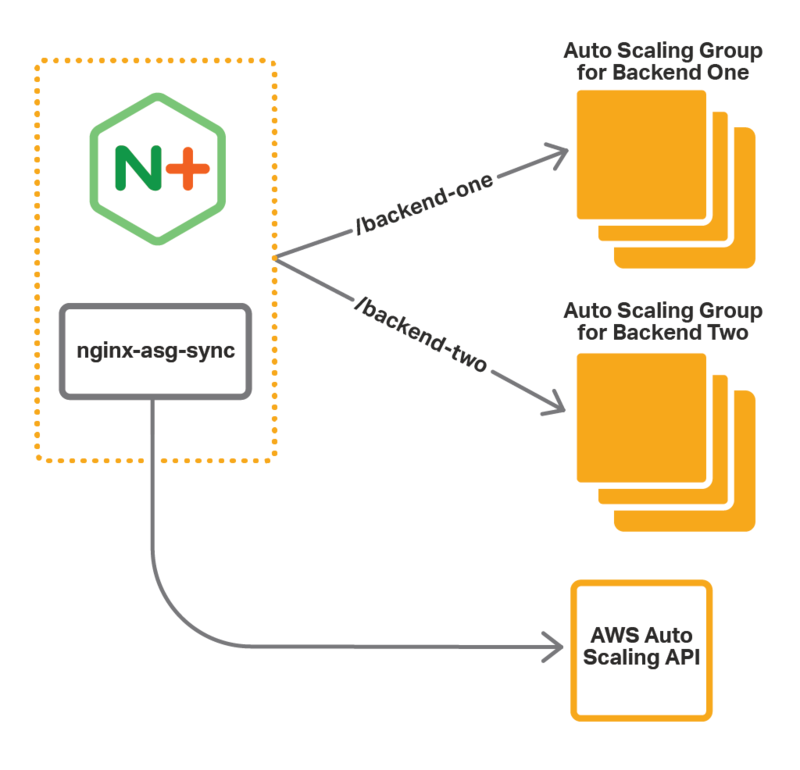 Using NGINX Plus with integration software provided by NGINX, Inc.
After reading this blog post you will be ready to deploy NGINX Plus on AWS to provide advanced load balancing for Auto Scaling groups. Requests for /backend-one go to Backend One. Requests for /backend-two go to Backend Two. When we scale the application Auto Scaling groups (either automatically or manually), the load balancer configuration must be updated to reflect the new number of application instances. The built-in AWS load balancers do this automatically. For NGINX Plus, we need to propagate scaling events to the configuration with one of the methods mentioned above (NGINX Plus in front of ELB, or NGINX Plus with the integration software). Another way to update the NGINX Plus configuration in response to scaling events is with an external service registry. NGINX Plus supports integration with service discovery systems that provide a DNS interface, such as Consul. In this blog post, we focus on solutions that do not rely on using external systems and that are easy to set up and use. In this case, NGINX Plus acts as a proxy/load balancer for one or more ELBs. Using its advanced routing capabilities, NGINX Plus forwards requests to the appropriate ELB based on the request URI. The ELB then passes the request to one of the instances in the Auto Scaling group. In this configuration, ELB provides the support for scaling. The resolver directive defines the DNS server that NGINX Plus uses to resolve the DNS names of the internal ELB instances. Here it is the IP address of the AWS DNS server. We create two upstream blocks, one for each Auto Scaling group corresponding to our services, Backend One and Backend Two. 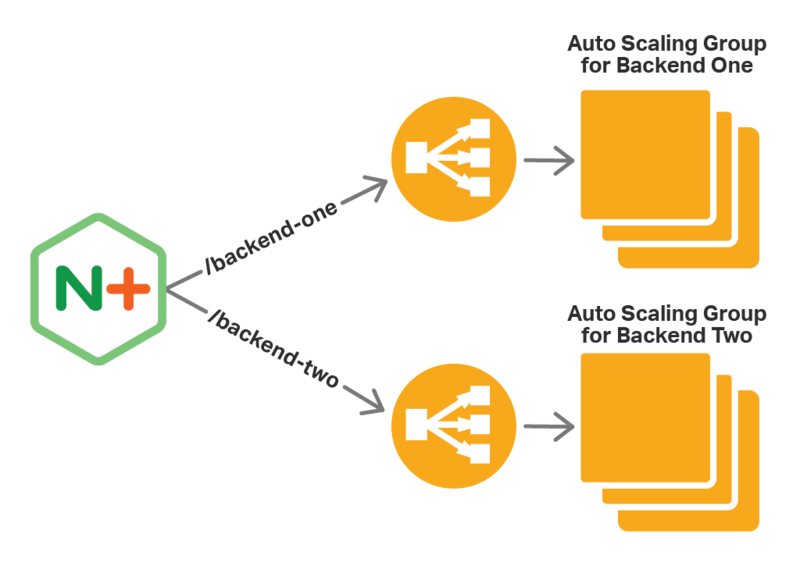 We identify the Auto Scaling group by the DNS name of the ELB that load balances traffic to it. Using the resolve parameter, we tell NGINX Plus to periodically re-resolve the name – the frequency is set by the valid parameter to the resolver directive discussed in the previous bullet. Here we set it to 10 seconds because the IP addresses of ELB are subject to frequent change. The zone directive allocates memory (here up to 64 KB) for storing the resolved IP addresses. We define a virtual server that listens on port 80. The location blocks tell NGINX Plus to pass requests for /backend-one to the ELB for the Backend One Auto Scaling group and requests for /backend-two to the ELB for the Backend Two Auto Scaling group. Limited load-balancing options. Because NGINX Plus passes requests to ELB, not to the backend instances directly, it is the ELB that is doing load balancing. For this reason, you cannot take advantage of NGINX Plus’ more sophisticated load balancing algorithms and session persistence options. Redundancy. NGINX Plus can do load balancing, so ELB is redundant — we’re using it only because it is natively integrated with Auto Scaling. Limited protocol support. Unlike NGINX Plus, ELB does not support WebSocket and UDP. The next method does not rely on ELB and consequently does not have those disadvantages. With this method, you install additional integration software along with NGINX Plus. The software (nginx-asg-sync) constantly monitors Auto Scaling groups. When it sees that a scaling event has happened, it adds or removes backend instances from the NGINX Plus configuration. As shown, nginx-asg-sync learns about changes to Auto Scaling groups via the AWS Auto Scaling API. Set up access to the AWS API. The instructions assume that the Auto Scaling groups for the backends already exist. They also assume that NGINX Plus is running on an Amazon Linux AMI. Communication with the Auto Scaling API is authenticated, so you must provide credentials for nginx-asg-sync. AWS uses IAM roles to handle credentials, so you need to create a role for the NGINX Plus instance before launching it. For step-by-step instructions, see IAM Roles for Amazon EC2 in the AWS documentation. Create an IAM role and attach the predefined AmazonEC2ReadOnlyAccess policy to it. This policy allows read-only access to EC2 APIs. When you launch the NGINX Plus instance, add this IAM role to the instance. To install the integration software, download the package for your operating system from the nginx-asg-sync GitHub repository, and install it on the instance where NGINX Plus is running. For complete installation instructions, see the documentation on GitHub. 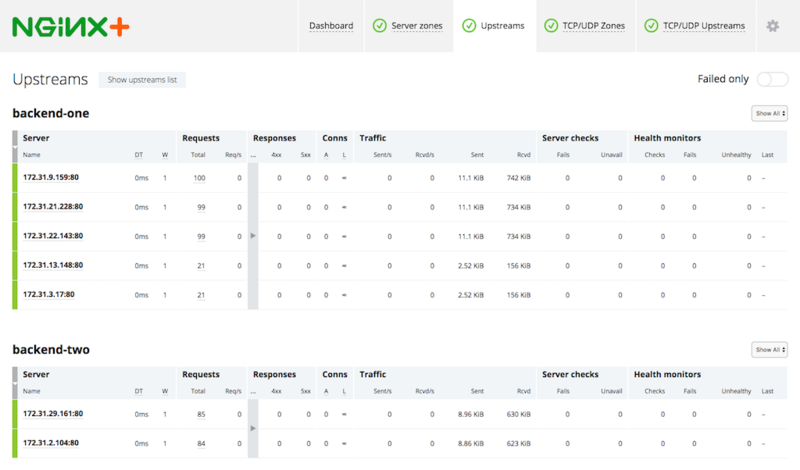 Configure the API endpoints for on-the-fly reconfiguration and live activity monitoring. The integration software uses these endpoints to add and remove backend instances from upstream groups. Create an upstream block for each Auto Scaling group. Do not define any servers in the block, as nginx-asg-sync adds and removes them automatically in response to scaling events. As in the ELB example, we declare two upstream groups – backend-one and backend-two, which correspond to our Auto Scaling groups. Here, however, we do not add any servers to the upstream groups, because the servers will be added by nginx-aws-sync. The state directive names the file where the dynamically configurable list of servers is stored, enabling it to persist across restarts of NGINX Plus. We define a virtual serverthat listens on port 80. In contrast to the ELB example, NGINX Plus passes requests for /backend-one directly to the instances of the Backend One group, and requests for /backend-two directly to the instances of the Backend Two group. The on-the-fly API is available at 127.0.0.1:8080/upstream_conf. The status API is available at 127.0.0.1:8080/status. The region key defines the AWS region where we deploy our application. The upstream_conf_endpoint and status_endpoint keys define the NGINX Plus API endpoints, which we configured in Step 3. The sync_interval_in_seconds key defines the synchronization interval: nginx-asg-sync checks for scaling updates every five seconds. name: The name we specified for the upstream block in Step 3.
autoscaling_group: The name of the corresponding Auto Scaling group. port: The port on which our backend services are exposed. kind: The protocol of the traffic NGINX Plus load balances to the backend application, here http. If the application uses TCP/UDP, specify stream instead. In the steps above, we configured NGINX Plus to load balance Auto Scaling groups for our application. Now we can test it. NGINX Plus distributes requests with the /backend-one URI to the instances of the Backend One group, and requests with the /backend-two URI to the instances of the Backend Two group. AWS Auto Scaling provides the benefit of adjusting the number of application instances to the level of demand. 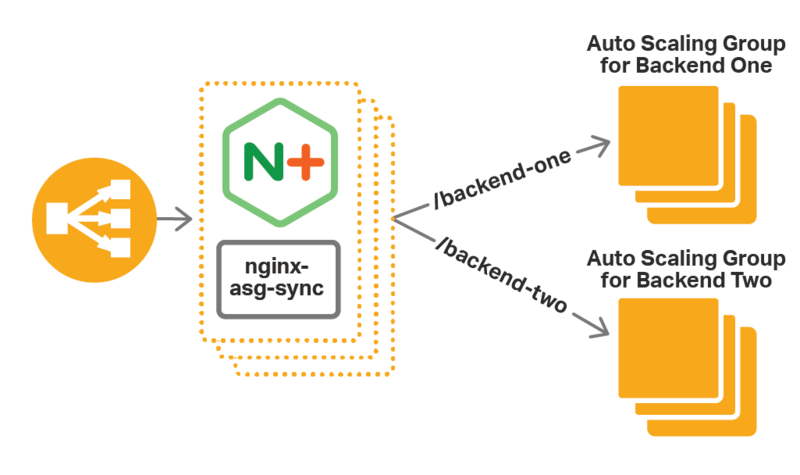 NGINX Plus provides advanced load-balancing features that can be used in conjunction with AWS Auto Scaling groups. Published at DZone with permission of Michael Pleshakov , DZone MVB. See the original article here.